Despite the review title, don’t expect Mephistopheles to show up much in this modern retelling of the Faust legend. The suave devil (who never actually gives a name) doesn’t put in an appearance until about halfway through the book, if he’s real at all. Mann leaves it up to the reader whether the devil is actually there or is a product of syphilitic madness …or whether it even matters one way or the other. 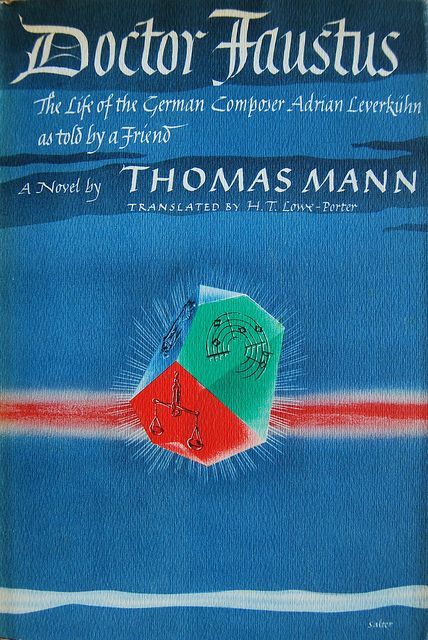 To Mann, the important thing seems to be exploring a variety of philosophical themes. Most central to the plot is the connection between artistic genius and suffering, especially in the form of madness & alienation. Other themes includes the character and history of the German people (especially as it relates to losing both World Wars), avant garde art, apocalyptic imagery, and highly detailed music theory. As the subtitle indicates, the novel is presented as a biography of the tragic life of (fictional) composer Adrian Leverkuhn. The narrator sounds agitated, apologizing for his poor organization, jumping around in the story, and digressing into his own personal life (he, like the author, is a German living through World War II). I found the style believable but somewhat irritating. Leverkuhn himself is presented as a sociopathic genius whose musical masterpieces are only fully appreciated by the few truly cultured people. As in any Faust story, in the end, there’s a price to be paid when you make a deal with the devil (or contract syphilis). Overall, there were a lot of interesting ideas in this book, but after 500+ pages it felt overblown and pretentious. Additionally: I’ll be using this for my 20th Century Classic category at the Back to the Classics Challenge. Sounds fair enough about the writing- I’ve only read the Marlowe version (I think I muddled things up when you mentioned this last) but I think I’ll stick with that, because this sounds a little on the convoluted side and I’m never hugely fond of pretentious reads. fantastic review! Marlowe’s version is definitely more my speed, too. I really have to go back and re-read it because I only read it once and it’s been a few years. What really stuck with me from my first reading was how Faust’s insistence that he was damned even when repeatedly offered divine forgiveness/salvation. Oh that’s a great point! I honestly hadn’t thought about that before!